A magnetic knee brace is a specially designed knee support that contains magnets strategically placed to surround the knee joint region, especially around the kneecap, to help reduce pain and inflammation. Magnetic therapy has been used for hundreds of years as a drug-free, non-invasive treatment for pain and swelling. There are differing opinions about the effectiveness of magnets, but many people find them beneficial, especially for conditions like arthritis. Magnetic knee braces combine the support and warmth of a knee brace with the effects of magnetic therapy. Here we will look at how they work, look at some of the most popular magnetic knee braces out there and the safety issues when using magnetic therapy. Magnetic fields are believed to attract and repel charged particles in the blood creating movement and heat. This would cause blood vessels to widen which accelerates healing by bringing in fresh oxygen and nutrients and removing toxins. This could all help to reduce inflammation and stiffness. Magnetic fields are also thought to trigger the nervous system which reduces the pain signals sent to the brain thereby reducing the amount of pain felt. Magnetic therapy also reportedly benefits the whole body by improving sleep quality and activity levels as well as reducing stress. Many people report significant benefits from magnetic therapy, however medical opinion is divided and at present, there is a lack of scientific data to validate the efficacy of magnets. The physical and biological claims made are currently unproven and no effects on health or healing have been fully established. Here are some different magnetic braces that people have found beneficial in reducing their knee pain whilst providing support. 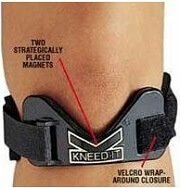 KneedIt’s Summary: The KneedIt knee support band is a magnetic strap contains two strategically placed magnets and is designed to relieve minor knee pain, soreness, stiffness and inflammation, and improve patellar tracking. It is particularly effective with arthritis, tendonitis and chondromalacia. 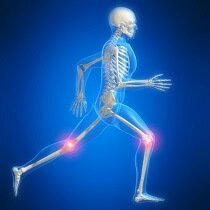 As you move, it applies gentle pressure to the joint and patellar tendon, and stabilises the kneecap. 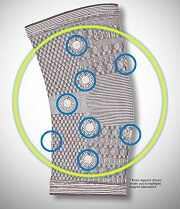 This magnetic strap was developed by an Orthopedic Surgeon and Sports Medicine Specialist. One size fits most due to Velcro wrap around closure. My verdict: Knee straps may not look like much, but they can be really effective for relieving knee pain. Average user rating 4.4/5. For-Knees’s Summary: Thirteen strategically placed super magnets in strong supportive sleeve. Made of strong, breathable material containing tourmaline fibers which reflect back your body's warmth to help relieve pain, spasms and stiffness. My verdict: This magnetic knee brace will provide good support and compression. Average user rating 4.3/5. Medipaq's Summary: 16 strategically placed magnets positioned over acupuncture and trigger points. 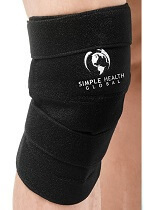 Provides support, warmth, stimulates circulation and eases swelling. Made of super-soft stretchable material. Available in two sizes, S/M & L.
My verdict: Easy to apply, comfortable to wear and very reasonably priced. Most people find the L is the right size for them. Average user rating 4.1/5. TechAffect's Summary: Adjustable single knee support with magnetic inserts. Contains inlaid magnetic strips around the sides of the kneecap. It helps to prevent knee injuries. Easy and comfortable to wear with a simple adjustable Velcro strap. My verdict: This magnetic knee brace receives very positive reviews with an average user rating of 4.4/5. 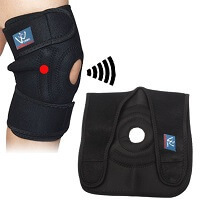 If you are not that fussed about the magnets, take a look at the Knee Brace Guide to find out about a huge range of knee braces that get great customer reviews for all kinds of knee pain offering everything from basic pull up sleeves to elite sports knee braces.